Blossom is a collaboration between Cornell University’s Human-Robot Collaboration and Companionship Lab and Google Creative Technologies Singapore. Vyo is a personal assistant serving as a centralized interface for smart home devices. With both social robotics and smart homes on the brink of market feasibility, Vyo offers an alternative to the more common touch-screen and voice-control interfaces. Vyo’s design is that of a peripheral robot, straddling the boundary between home appliance and social presence. Users interact with the device using physical icons and quiet gestures, promoting the domestic sense of home technology. Travis (aka Shimi) is a robotic smartphone speaker dock and music listening companion. 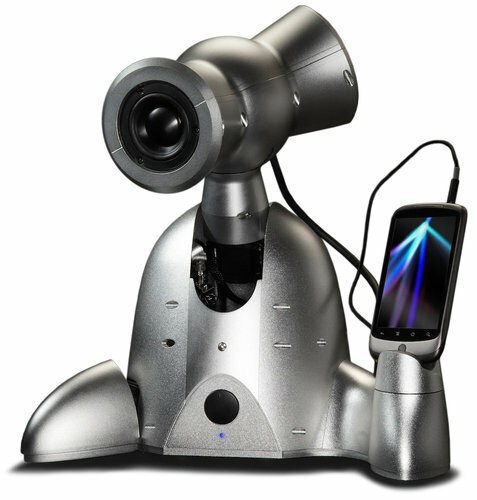 Travis is a musical entertainment robot computationally controlled by an Android smartphone, and serves both as an amplified speaker dock, and a socially expressive robot. Travis is designed to enhance a human’s music listening experience by providing social presence and audience companionship, as well as by embodying the music played on the device as a performance. We developed Travis as a research platform to examine human-robot interaction as it relates to media consumption, robotic companionship, nonverbal behavior, timing, and physical presence. Shimon is a robotic musician, built to explore and research robotic musical improvisation in human-robot joint ensembles. I worked on it in Gil Weinberg’s Georgia Tech Center for Music Technology. Recognizing that music is not just about note production, but also about communicating with band members and audiences, I set out adding a socially expressive head to the robot. Using a combination of techniques from animation, architecture, motion design, and mechanical engineering, this non-anthropomorphic robot is capable of high expressivity, despite very few degrees-of-freedom. The robot is used in research at the Georgia Institute of Technology, and in musical performances worldwide. This non-anthropomorphic collaborative robot was developed as part of research on human-robot fluency and collaboration. AUR is used to investigate notions of non-anthropomorphic robotic form, anticipation in joint activity, embodied and perceptual memory, practice in human-robot teams, and the application of theories of theater acting on robot behavior. This robot won the gold prize in the 2007 IEEE Int’l Robot Design Competition.